A grill placed too close to anything that can burn is a fire hazard. They can be very hot, causing burn injuries. 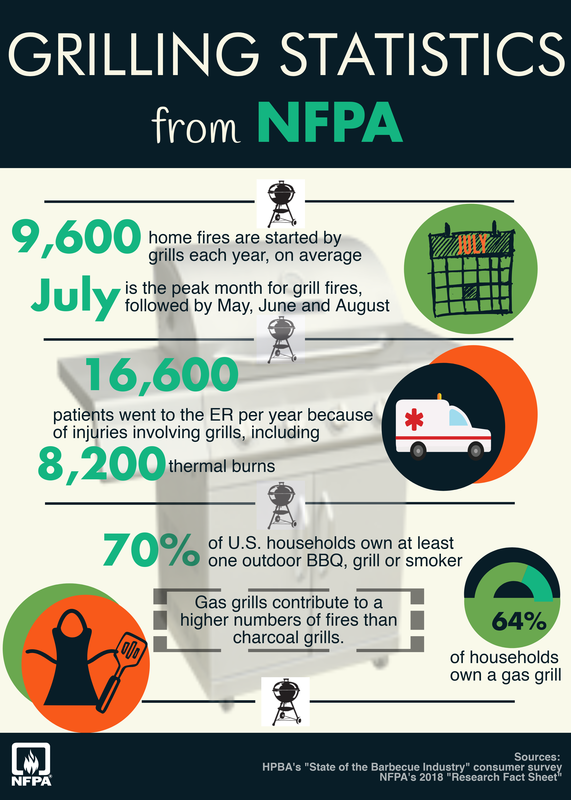 NFPA has created a grilling infographic for you to use on your website, blogs, Facebook and Twitter. Just download the graphic, and place wherever you want to use it. Please link to www.nfpa.org/grilling. Guy Colonna, NFPA Division Manager, Industrial ＆ Chemical Engineering, gives some basic tips on how to prepare your grill before your first cookout of the season. Check out our sample social media posts on grilling safety. Plan on taking your grill with you on a camping trip or picnic? Check out our tips that feature fire safe information on charcoal grills, barbecues and hibatchis. Grilling social media posts Use our sample posts on your social media sites to encourage everyone to grill safely.